Plants often forming large clumps, rhizomes, if present, with internodes shorter than 2 cm. Culms 1-3 m, often glaucous. Sheaths glabrous or pilose; ligules 0.4-2.5 mm; blades 5-50 cm long, (2)5-10 mm wide, usually pilose adaxially, at least near the collar. 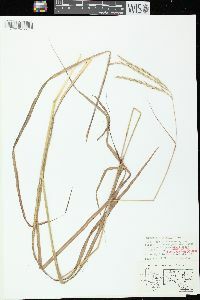 Inflorescence units usually only terminal; peduncles with 2-6(10) rames; rames 5-11 cm, exserted at maturity, usually purplish, sometimes yellowish; internodes sparsely to densely pubescent, hairs 2.2-4.2 mm, usually white, rarely yellowish. 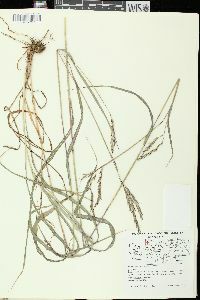 Sessile spikelets 5-11 mm, scabrous; awns 8-25 mm; anthers 3, 2.5-4.5 mm. Pedicellate spikelets 3.5-12 mm, usually well-developed and staminate. 2n = 20, 40, 60 (usually), 70, 80, 90. Andropogon gerardii grows in prairies, meadows, and generally dry soils. It is a widespread species, extending from southern Canada to Mexico, and was once dominant over much of its range. 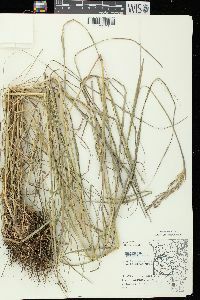 It is frequently planted for erosion control, restoration, or as an ornamental; the records from Washington and central Montana reflect such plantings. 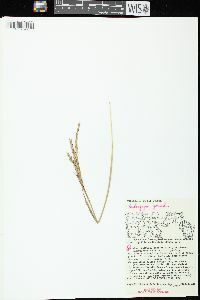 It hybridizes with A. hallii, the two sometimes being treated as conspecific subspecies. Perennial herb forming large clumps, sometimes bearing rhizomes with internodes to 2 cm long 1 - 3.1 m tall Leaves: with hairless or soft-haired sheaths and 0.4 - 2.5 mm long, membranous ligules. The blades are 5 - 50 cm long, 2 - 10 mm wide, linear, and usually soft-haired on the upper surface (especially near the collar). 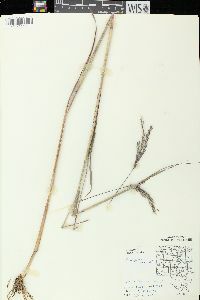 Inflorescence: terminal, usually purplish but occasionally yellowish, with two to ten spikes 5 - 11 cm long, the internodes usually having white hairs 2.2 - 4.2 mm long. Fruit: a caryopsis. Culm: erect, highly branched above, 1 - 3 m long, usually covered with a whitish waxy coating (glaucous). Spikelets: either stalkless or stalked. 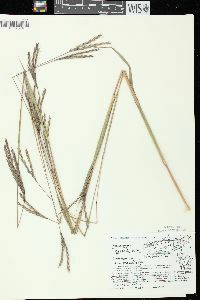 The stalkless spikelets are bisexual, 5 - 11 mm long, and rough, and the stalked spikelets are male, 3.5 - 12 mm long, and well-developed. 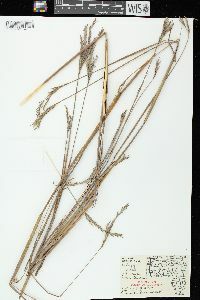 Glumes: minutely rough, often lined with hairs along the margins. The lower glume is thinly leather-like and has two longitudinal ridges that are usually winged. 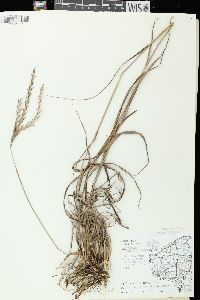 Florets: of the stalkless spikelets have a lemma with an awn 8 - 25 mm long and three anthers 2.5 - 4.5 mm long. 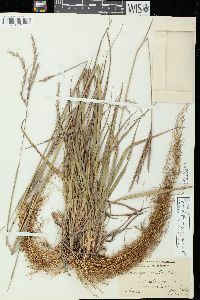 Similar species: Andropogon virginicus is easily distinguished because its inflorescences are shorter than 5 cm, the stalked spikelets are absent or rudimentary, and the florets usually only have one anther. 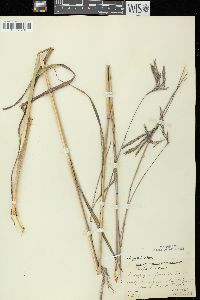 Andropogon hallii differs by having awns (if present) to 11 mm long, ligules 0.9 - 4.5 mm long, and rhizomes with internodes longer than 2 cm. Habitat and ecology: This species is common in moist and dry prairies and is often found along railroad tracks. It is usually the only surviving prairie species after a habitat has been destroyed. Etymology: Andropogon comes from the Greek words aner, meaning man, and pogon, meaning beard. Gerardii is named after French botanist Louis Gerard (1733 - 1819). Found sparingly throughout the state except in the prairie areas where it is common and where, before cultivation, it usually formed complete stands over all of the drier parts. This grass prefers a rather dry, sandy habitat but I have found it in hard, white clay soil in the Lower Wabash Bottoms and on rocky bars in streams. Outside the prairie area it is very erratic in its locations.